Nissan is today celebrating the dawn of a bold new era in European car manufacturing with the official start of production of the new and improved, 100% electric Nissan LEAF. 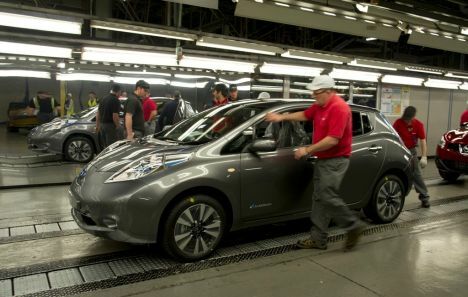 This new Nissan LEAF, incorporating more than 100 updates, is now rolling off the line at the company's record-breaking Sunderland Plant, using advanced lithium-ion batteries manufactured in Nissan's new UK Battery Plant. Today marks the culmination of four years of preparation at the plant and a previously announced £420m investment by Nissan. Together the Battery Plant and Nissan LEAF production are supporting jobs for more than 2,000 people in the UK car industry, including more than 500 directly at Nissan. Nissan's continuing innovation means the world's best-selling electric vehicle is now even better. The new LEAF for 2013 has more than 100 updates aimed at making Nissan's zero-emissions technology accessible to even more European drivers, including an increased driving range of 199km (124 miles) and the ability to recharge in half the time of the first-generation LEAF. UK Prime Minister, the Rt. Hon. David Cameron said: "Nissan's record breaking year last year is a success story for UK volume car manufacturing and demonstrates how our automotive industry is competing and thriving in the global race. I warmly welcome the production of the new electric LEAF model and battery plant at Sunderland. This £420 million investment, backed by Government, is supporting over 2,000 jobs in our automotive sector including more than 500 at Nissan in Sunderland, helping people in the area who want to work hard and get on.